Hey there! I'm Kristina Valjas, a 26 year old aspiring Olympian, doing what I absolutely love to do, playing beach volleyball every day! Here's a little info about how I got where I am today. I have recently graduated from the University of Toronto with an undergraduate degree in Linguistics. I was a member of the Varsity Blues Women's Indoor Volleyball Team from 2005 to 2010. My parents, Peter and Marianne, both played for the Blues while they were in school at UofT. I was first introduced to beach volleyball in 2005 by my varsity indoor volleyball coach as a form of off-season training. Since then I have developed a love for the sport and I have dreams of competing in the 2015 PanAm games and the 2016 Olympics. Follow me as I travel around the world, competing for Team Canada in the best sport in the world! 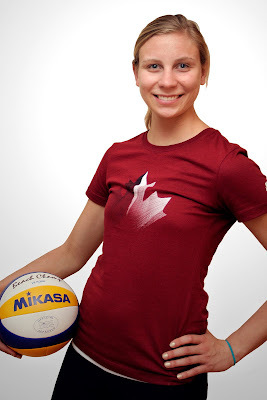 Follow me as I travel around the world playing beach volleyball for Team Canada! Like our team on Facebook!